The gravitational pull to meet hate with hate and ignorance with ridicule and disgust is strong and difficult to ignore. I appreciated so much this week when our Bishop in DC called us to love, to respond with what is best in humanity and not with violence or more hatred. I have made time this week to listen to the voices that matter, voices which lead me to love, to peace, to something positive. I can’t be there at Lafayette Square to be seen today, but I still have a responsibility to be heard. We all must be heard. White supremacy is wrong, sinful, ignorant and destructive. Racism is a killing white sin in our society which must be confronted and defeated. These militant white supremacist clowns dressed up with their Confederate patches, racist flags and guns, and their narrative of hate and division, must be rejected with courage, dignity and love at every opportunity. (By the way, DC has said “no guns” to the white supremacists at this protest. Wouldn’t it be nice if what works to keep the President’s house safe would be applied to keep us all safe? hmmmm) We must always fight for liberty, equality and justice… but let us not have fighting in the streets. We need to make sure we elect the women and men who will help us bring the needed change. #midterms We need to have the courage to speak up against division and hate. We have to be heard. Let’s change the narrative every time someone says we’re losing American culture or white culture or some other racist code phrase. America has never been a culture, but a joining of cultures. America has never been perfect, but a tension filled meeting of diverse people who can very often make beautiful things from our sharing. We have never been red white and blue, but every wonderful shade of human. This entry was posted in Civility, Racism, White Supremacy and tagged love, peace, protests, White Supremacy. I had to go to the MVA yesterday. Yes, the dreaded Motor Vehicle Administration of Maryland. It might be the DMV where you live or some other innocuous sounding jumble of letters, but it means the same thing: a little death. My vehicle registration had expired on June 1, and yesterday was June 13, but it had taken me that long to track down all the flags and little things to tidy up before I could renew, to the tune of several hundred dollars. I thought it was all done, and I thought I’d be in and out of there. I arrived to find that EZPass, the nefarious organization which runs a local crime syndicate called “Tollway” had more outstanding fines for me to pay than their enforcer had told me on the phone last week. I had been told that the $50 I paid last week would get me in the clear, but their mob muscle at the MVA detailed another $650 or so I’d have to pay before I could ever drive legally again on Maryland turf. I posted the Gif here of a collapsing baby on Facebook from a place of inner pain and hopeless I thought could only be visualized by the falling innocence and dejection of an infant who would surely also flop right off the couch and land on their face. #carpetburn Really, this was all too much to take in… so much worse than their only having Diet Pepsi available as the low calorie soda option in the vending machine. I was upset. I was stunned. I did not have $650 to clear my good name and my Nissan’s registration. Of course, I could have yelled and stamped my feet. I really, really, really wanted to yell and stamp my feet and basically wig the fruit right out of my grits and bacon. But let’s be real for a minute… everything and I mean everything my faith is supposed to be about is about not doing that kind of thing. I am supposed to be forgiving, patient, kind, joyful in distress and expectant of good things, among other things, all of which sound great in sermons and hymns and are really difficult at the MVA. I don’t know what exactly the woman with EZPAss saw in my face, the hopelessness, the patience, or just a face not screaming obscenities at her from a mess of my own making, but she next says these amazing and unexpected words: Have you ever had a one-time waiver? A one-time waiver? I’ve suddenly got that feeling like Katniss when the salve dropped in on a chiming parachute to heal Pita: hope. I have not had this thing, tell me more. She goes on to detail that she has the power to give me this waiver and bids me wait a moment while she checks and receives instructions from a small robot overlord on her desk she reverently called “My System.” She smiles and explains that all my many $50+ fines adding up to almost $650 can all be magically changed to $3 fines, but only once in my life. There can be only one. I had not had this done for me ever, so she could do it now, and all my fines and fees and great debt were shrunk to a total of $70. I like to rant about the MVA. It’s fun to rant on the MVA. But once I cleared things with EZPass, I was out of there in barely more than thirty minutes updating the address on my license and renewing my registration. So as much as ranting might be fun and even funny, I have to be grateful. I have to be thankful. I’m so thankful that EZPass is housed at the MVA and I didn’t have to travel across the state to find them. And I’m glad I didn’t go nuts, because I’m supposed to be nice. I’m grateful for the ease with which things were settled, and for keeping my fruit together. Amen. This entry was posted in Civility, Humor, Just Life and tagged Civility, MVA, Nice, Thankfulness. I have waited and reflected a bit since my pilgrimage to Israel and Palestine before writing something about the conflict between the State of Israel and the Palestinians. Recent violence in Gaza and the conflicting destructive messaging all around in my social media circles has compelled me to go ahead and get this written out. I want to be clear and I want to be irenic (peace-making) in what I say. I was deeply grieved and affected by what I saw in Palestine. I was moved by the daily plight of Palestinians in the West Bank having to navigate checkpoints and walls in their daily lives. I was moved by the stories of families and communities who were displaced and dispossessed in the late 40’s when Zionist armed forces removed them from their homes and lands and set them adrift. And what I personally saw was just in the West Bank, we aren’t even talking about the world’s largest open-air prison, the Gaza Strip. As I process what I saw and what I have come to hope for, let me be clear about a few things. I support the right of the State of Israel to exist, I support it as much as I support the existence a Palestinian State. I would support even more a single state which granted full human rights and civil liberties to all the people within it’s borders regardless of race or religion. Sounds down right American, right? This is my left hand most days now, pictured to the right, with my wedding band inscribed in Hebrew and my bracelet bearing the Palestinian flag and the word love. I choose not to hate either people, or to ignore the needs of either people. My desire is for a peaceful, secure home for all the people of that land. I am glad that the State of Israel was created as a solution to the global and historical problem of anti Semitism and existential threat to the Jewish people which culminated in the Holocaust. I am aware of and terribly empathetic to the needs of the that time which moved the international community to sanction and support the creation of the State of Israel. I have no ill will toward Jewish people or Israeli citizens. Now let me be as clear on the Palestinian people. They are a dispossessed and disenfranchised people, expelled from their homes, some into exile in other countries and some into lives as exiles near or on their own lands. As a group they were forced into this situation by immigrating Jewish families and Zionist forces, at gunpoint, and their plight has been one of the great injustices of our age. Even as the international community has leveraged it’s great moral weight and power to end Apartheid in South Africa, it ironically has ignored the similar plight of the Palestinians and their systematic and nearly complete disenfranchisement under an invading and expanding power. The State of Israel has not been a shining example of democracy in the Middle East, but along with it’s achievements and progress as a nation and a military power it has systematically destroyed a people, occupied and dehumanized them, and never extended them full citizenship in their own land or anything near equal representation. When speaking of the Israeli settlements and occupation of Palestinian lands Henry Seigman (past National Director of the American Jewish Congress) only a decade ago warned us that, “As a result of that ‘achievement,’ one that successive Israeli governments have long sought in order to preclude the possibility of a two-state solution, Israel has crossed the threshold from ‘the only democracy in the Middle East’ to the only apartheid regime in the Western world.” <— source The Palestinian people have been repeatedly removed from their homes and lands to make room for immigrating Jewish families, and with the newest settlement under construction just last year, they are still being displaced and dispossessed, today. That great injustice, met so often with war from without and terrorism from within, has been the foundation of all the death and hopelessness we see, today. That is what we call a 40,000 foot view, from up in the clouds. Down on earth today we have Israeli settlements, Hamas, the PLO, checkpoints and walls of separation, Zionism, the War of 1967, the Oslo Accords, armed occupation and terrorism. We have a human rights mess of titanic proportions including the most recent demonstrations for the Right of Return in the Gaza Strip and the brutal, lethal military responses of the IDF. There is such an enormous difference in Israel and Palestine today between the Israeli cities and the cities of Palestine, an enormous gap in wealth, stability and hope. You can wine and dine in Haifa, Israel, and struggle to find basic affordable medical care in Nablus, Palestine, on the same day. And yet in both areas we find human beings, families, neighbors, communities seeking a future and deserving one. We must take a longer view to find a way to peace. Solutions are not found in one-sided histories or focus on any one day’s violence. If you choose to unconditionally support the State of Israel continuing as it has, then you point to Hamas and speak of a sovereign state defending it’s borders. If you choose to unconditionally support the Palestinians, then you ignore the indiscriminate terrorism of Palestinian factions and speak of the State of Israel only as an oppressor and only as an occupier. I am asking that we change this narrative to speak unconditionally of human dignity and equity, and about the needs of the future. The security of the Israeli people is bound to the security of the Palestinian people. Justice and peace for both sides must be founded in an equity of belonging, an equity of civil rights, and an equity of human dignity. We citizens of the United States learned (and are still learning) this lesson in our own country as we deal with the deep and painful legacy and resurgent reality of racism and oppression in our own nation as we are still learning to live together. We eventually joined the international community and helped end Apartheid in South Africa… not by killing the white South Africans, but by demanding equity and taking economic and political steps to stop the oppression. We must do the same for the Palestinians. This is not about killing Jews or destroying the State of Israel, but about ending the oppression upon which it currently has anchored itself. This is about saving the both Palestinian people and the State of Israel, for their future security and peace are inextricably bound. As we recognize that the State of Israel was established to protect the human dignity of the Jews, we must also as honestly recognize the great human injustice done to the Palestinian people in that establishment. That injustice is the foundation for the narrative of hate, violence, terrorism and displacement which we have witnessed for the past seventy years and this very day. A new foundation must be laid for the future because anything built on that kind of injustice will forever be plagued by the violence, confusion and loss of human dignity we have witnessed. As we work to help change this narrative we must also deal with our culpability as a nation. Our money has financed and backed the Israeli military for decades. We have ignored the injustices done to the Palestinian people. We have rationalized and sided with oppression, and that must change. Rev. Naim Ateek who recently spoke in Chevy Chase, Maryland, at St. John’s Episcopal Church and said, “The God we believe in loves justice and all people equally.” I agree. He’s an Anglican Priest, a Palestinian, an author, a theologian and no enemy to any human being. His books can found on Amazon right here! Sabeel is the foundation for peace and dialogue which was established by Rev. Naim Ateek. FOSNA is the Friends of Sabeel North America and offers ways to be involved with Sabeel and a peaceful way forward in the Middle East between Israel and Palestine. Jewish Voice for Peace is an amazing Jewish voice for our time! They are a great resource for our peace studies. I wish I knew an easy, concrete answer to making peace in the Middle East happen today or tomorrow. I don’t think that such an easy answer exists, but I do fully believe that a secure, peaceful and joyful future for both Israel and Palestine does exist. We have to change our thinking and telling of the narrative, and speak and act for that peace. We have to give each other the grace to grapple with these emotionally charged issues and events, and stay committed to arriving on the other side together. We must at all costs avoid the voices of one-sided extremism who call us to violence and to hatred. On a personal note… I love my many Jewish friends. I love and appreciate our shared religious roots and I abhor the anti Semitism and history of racial discrimination that Jewish people have faced around the world, and sadly often at the hands of my sisters and brothers in Christ. You matter to me. The safety and security of people in the State of Israel matter to me. I also love my Muslim friends, a group which has grown in recent years and months to include Palestinian friends of both Muslim and Christian faiths. Your lives matter to me and the future joy and security of the Palestinian people matter to me. Never think that I fall on one side or the other, but only ever strive to be on the side of human dignity, something that each and every one of us possesses in equal measure by God’s grace. Renouncing oppression, disenfranchisement and violence is our way forward, a way to peace that will never be purchased with rockets, bullets, bombs or walls. The sooner we can help our respective faith communities, social groups and governmental leaders change the narrative, the sooner we can take real steps toward the future that we all need and deserve. This entry was posted in Civility, News, peace and tagged Israel, Palestine, peace. Colin Kaepernick will be remembered for having initiated one of the most successful and powerful non-violent protests of our lifetime. Yes, he will be vindicated by history and the people name-calling and misrepresenting him will carry the shame. Colin hurt no one, broke no laws and defaced no property, but has been reviled and rejected for making his point. His point is that we don’t want to talk about the real problems, the racial sins of our nation in this very day, but we’d rather just roll along and pretend that America is all peaches and cream. Does it strike anyone as interesting that we are so riled up over the protest of an athlete? He’s essentially an entertainer, and his entertaining skill is his athleticism. He earned his place on that team, in that uniform, in that game, and he chose to use what he had earned to quietly send a message: It’s not all OK in America. It seems we don’t like having our sins pointed out, even in quiet non-violent ways. He’s accused of disrespecting the military and veterans. He has never spoken against them. He is accused of disrespecting the police. He has only spoken against the racism and injustice of police brutality. He’s accused of disrespecting our culture. He only has spoken against racism and unjust brutality, so is that an admission that some hold racism as part of a valuable cultural heritage? He has been called names, even by the highest elected politician of the land. He is no longer playing the sport he loves and is good at playing. He has paid the price of his protest and not backed down. Few of us have ever had the opportunity to make a fraction of the impact or display a shred of that courage. He’s done all this, has submitted to the ridicule and hatred, has possibly sacrificed his career and has been demonized and vilified by voices around the country, all to speak up for the voiceless. He kneels to stand for the defenseless. He is a saint. I hope that more of us have an opportunity to show his courage and to work as hard for the change that our society so desperately needs. 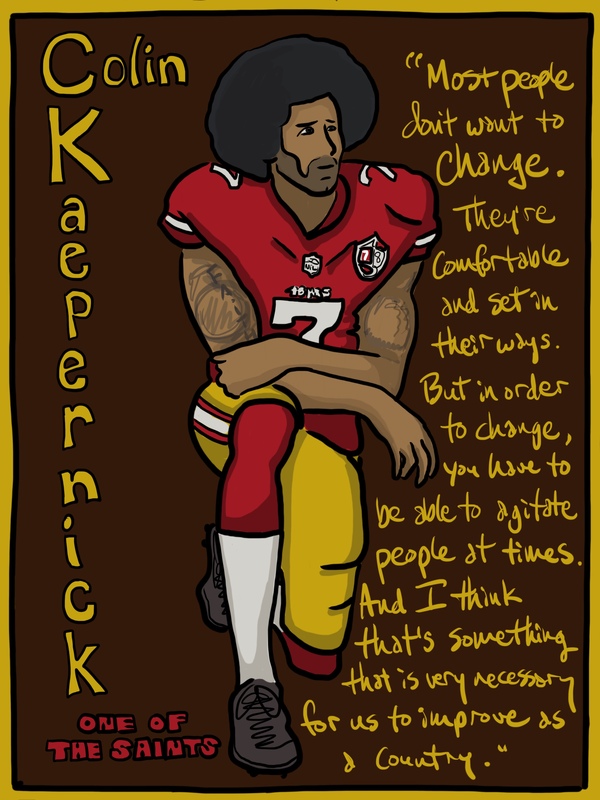 We need to talk about Colin and the nonviolent protests by other players because it is bringing out the worst of our nation. From faked images like the concocted flag burning by a Seahawks player, to the President cursing our citizens’ use of their First Amendment rights, to the Texans owner referring to the players as inmates, we have a real problem on our hands. There are prominent voices in our country who don’t want things changed, problems addressed and racial inequalities seen for what they are. This is why Colin is so important. This is why his faith and courage matter in this time and place. This entry was posted in Civility, Social Justice and tagged Colin Kaepernick, Courage, Peaceful Protest, Saints, Social Justice. We had such a beautiful Sunday, yesterday. Teresa and I fasted for social justice and mercy during the day with our Presiding Bishop Michael Curry and many others from the Episcopal Church and the Evangelical Lutheran Church of America. We also heard from a special guest in Sunday School, Imam Tarif Shraim of the Islamic Community Center of Potomac (the ICCP). He attended with another teacher from the ICCP and several of their youth. I met Imam Shraim at his mosque on my birthday, March 31 of this year, when I attended Friday prayers with other guests invited from our parish of St. John’s Episcopal Church Norwood. By the way, both Imam Shraim and Reverend Sari Ateek, our pastor, are Palestinians. When they are together you can feel the contagious energy of two humans thrilled to be present with each other. Imam Shraim was gracious and wise as he shared with our combined Sunday School of 8th to 12th graders some of what it is like to be a Muslim in America. He shared his own story of facing racial and religious hatred here in America (a high speed pursuit and attempt to run his family off the road) because they have brown skin and his wife chooses to wear a head scarf. He expressed sincere gratitude for his welcome at St. John’s, and he invited us all to visit the ICCP any time we can make it. I plan to visit again as soon as my work schedule allows, hopefully during the coming celebration of Ramadan, beginning the evening of May 27 until June 25. It warmed my heart to spend our class time helping our students grow in their understanding of our shared humanity with our Muslim neighbors, and our shared religious heritage and aspirations. I loved that our epistle reading in worship that morning was of the Apostle Paul in Athens, Acts 17:22-31. I’ve always believed that this should be a foundational text for our interaction with other faiths and adherents of other faiths. Paul shows respect for them and appreciation for what they share in common, and he even quotes their own poets. There is a humility and graciousness in this text that we have lost in so many of our own interactions with other faiths. Paul has a message to share and his own faith convictions, of course, but he doesn’t belittle, hate, fear or condemn the aspirations of the Athenians. This entry was posted in Civility, Connectedness, Devotional Thoughts, Islam and tagged Fasting, Interfaith, love, Muslim Neighbiors. It’s too easy today for white people to ignore the growing strength of white supremacy in our contemporary culture and political scene in the United States of America. Yes, white supremacy has been in the news because it is resurgent here in the US, right now. Being a white male with no inclinations of supremacy I could easily ignore the whole thing and choose not to participate, but that’s not enough. As a white male who in my inherent privilege is in no way personally threatened by the criminality of white supremacy I bear an inescapable responsibility to speak loudly and stridently against it. Every white person must accept this responsibility and speak loudly in defense of the truth of the dignity, worth and welcome of our non-white friends, family and neighbors. White supremacy is evil. White Supremacy is a lie. It is not a mental illness, because it is chosen. It is a crime against humanity. White supremacy is a systematic devaluing of human beings and it must be denounced and disowned. I do not advocate violence against white supremacists, but I do advocate for us all to speak clearly with grace, compassion and equity for all peoples’ value. Christians must decry the use of our religious symbols, our scriptures, our Christ and our God in white supremacy. Americans must decry the idea that we are lessened by our diversity. There is no room in Christianity for racial and ethnic discrimination, as there is no room for any other discriminations perpetrated in the name of Christ. There is no room for partiality and bias among the human family. There is no sacrosanct white culture or American culture. I do not interchange Christianity and American Nationalism here as equal or the same, but I use both because White Supremacy dresses itself in the trappings of each, falsely. Let us never tire of saying it loudly and repeatedly: White supremacy is a criminal lie. Let no lack of courage, conviction or compassion stop our voices. This entry was posted in Civility, Civility in Politics, Compassion, Diversity, Social Justice and tagged diversity, Human Family, responsibility, White Supremacy.